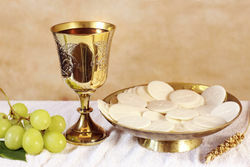 The Holy Eucharist, also known as Holy Communion, is the Christian ceremony commemorating the Last Supper, in which bread and wine are consecrated and consumed. The bread becomes Jesus' body and the wine becomes his blood. Matthew 26:26-28 says While they were eating, Jesus took bread, and when he had given thanks, he broke it and gave it to his disciples, saying, "Take and eat; this is my body." Then he took a cup, and when he had given thanks, he gave it to them, saying, "Drink from it, all of you. This is my blood of the covenant, which is poured out for many for the forgiveness of sins. Many churches across the world practice the Holy Eucharist as a way of enhancing and deepening their relationship no only with God, but also with their church family. There are many questions about the Holy Eucharist. A very popular question is why does Jesus give himself to us as food and drink. Jesus did this as a spiritual nourishment which unites us with him both spiritually and physically. Being united to Christ through the power of the Holy Spirit allows us to be drawn to an eternal relationship among the Father, the Son, And the Holy Spirit. Just as the living Father sent me and I have life because of the Father, so also the one who feeds on me will have life because of me" (Jn 6:57). This verse helps further our understand of the Holy Eucharist. Some Christian denominations such as quakerism, see the tradition as too formal and do not practice the Eucharist. In Fact, some denominations, specifically baptist, believe that the Eucharist should not be open to all christian, but only open to christians that have fulfilled initiation requirements. Eucharist was first introduced by Jesus the night before his crucifixion during the last supper, which was also the Passover meal. Jesus told hos disciples that the bread was his body and the wine was his blood. Jesus then told the to eat in remembrance of him. Eucharist is not only a meal but also a representation. A representation of the sacrifice that Jesus made to save us from our sins. This page was last modified on 9 January 2019, at 17:37.